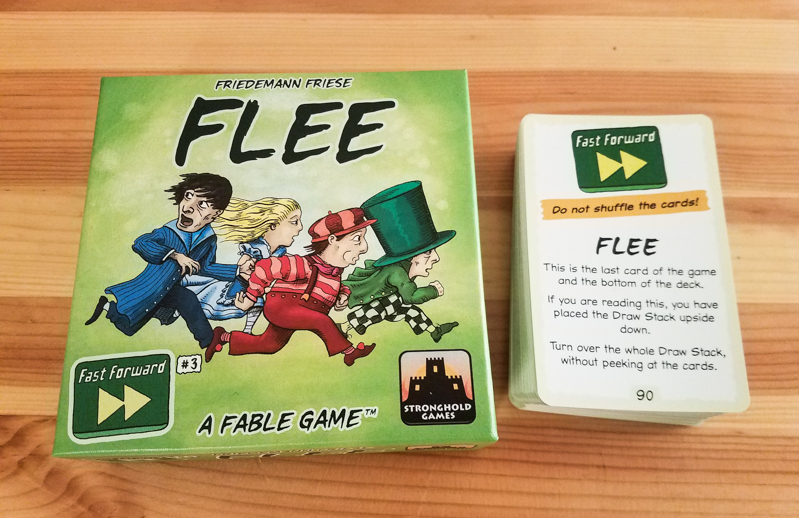 This Fast Forward: FLEE review was made after playing through the game one time (three losses, one win). What is Fast Forward: FLEE? 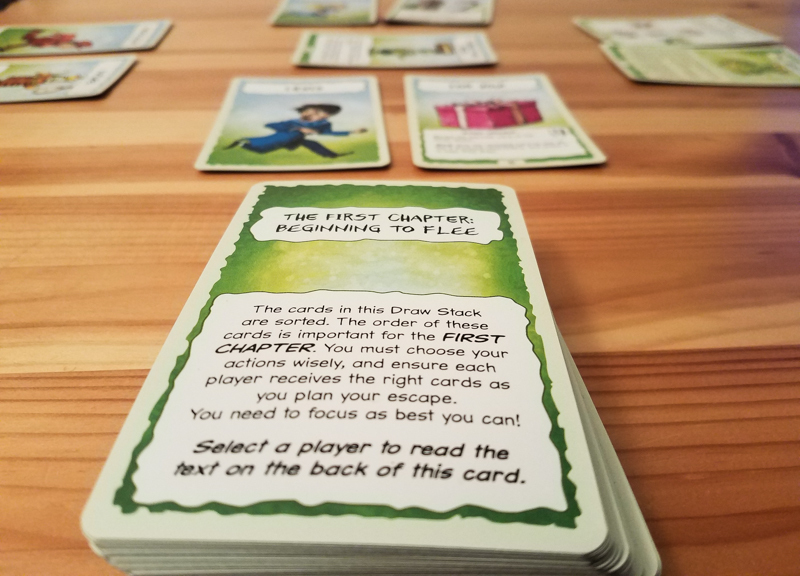 Fast Forward: FLEE is a cooperative card game in which you’re trying to keep four characters from being caught by a monster. It uses the Fable Game system, which was introduced by the same designer in the excellent game Fabled Fruit. 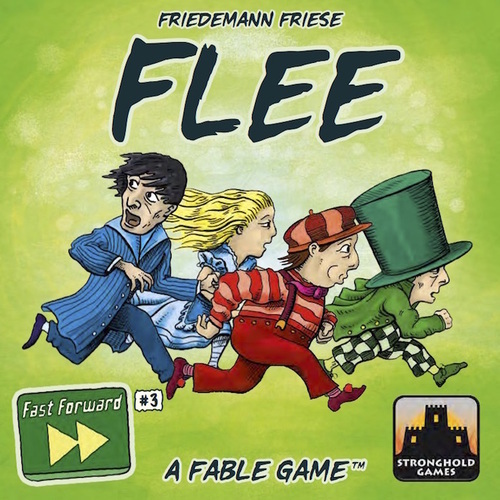 Fast Forward: FLEE was designed by Friedemann Friese and is published by Stronghold Games. Interestingly, you won’t have a rule book to read when you open the Fast Forward: FLEE box and you’ll barely know anything about the theme. That’s because this Fast Forward series of games was designed to teach you as you play. More rules will be added to the game as you move forward through the deck. For example, when you first draw a new type of card, the next card will probably have you stop and read some new rules so you know exactly how to use that new type of card. You place these rules cards above the play area for quick reference. Each of the four characters in Fast Forward: FLEE has his or her own play area. Each turn a character will need to take an action found on one of the cards in their play area and then discard that card. Sometimes a character will only have one card in their area, which can be a good or a bad thing depending on the card. Turns end by drawing a new card if the current character’s play area is empty. One character will always have the monster in front of them. If that character ever has to take a turn, you will lose the game. 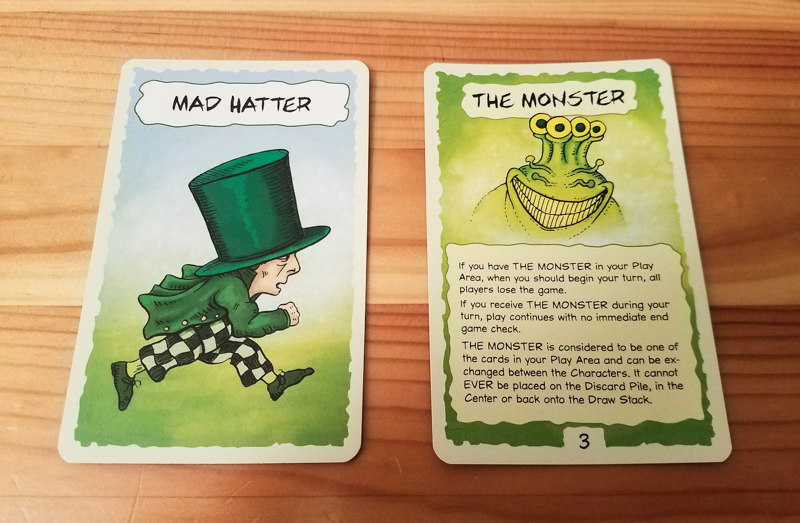 Mad Hatter begins the game with the monster, but you can use cards to move the monster around. This is what you spend most of the game thinking about. Does anyone have a card that will allow them to skip that character, or do you need to find a way to move the monster to another character? Players can control one or more characters each, or you can control them all collectively. We had a four-player group and decided to have each player have the final say for specific characters when the group couldn’t come to a decision on how to proceed. There are multiple “Chapters” you’ll have to get through in order to win. These are basically checkpoints that change up how you reset the game if you lose. And that’s about all I can say without venturing into spoiler territory. You’re taking actions, moving through the deck, and trying to avoid having to take a turn with the character that has the monster. There’s more to it than that, but you learn those new things as you play through the game. This is a challenging puzzle. We lost two times very early on in the game and one more time about two-thirds of the way through the deck. I don’t think any groups will be able to beat the game on their first try. Considering that this is a one-off experience, it’s great that the game is as tough as it is. I’m a big fan of this learn-as-you-go system. I’m usually the person in my group who has to read the rule books and teach games, so it was nice to learn the rules with the group for a change. Not once were we confused by a rule or felt like something was missing. That might not seem like a big deal, but it is to us after having to deal with some confusing and/or poorly written rule books recently. This isn’t a high-stress game, but there is a decent amount of suspense. You know you need to keep the character with the monster from taking a turn, but you’re not completely sure what you have to do to actually win and you never know what the next card will be. That’s pretty cool. I’m a big fan of the look of this game, but that might be because green is one of my favorite colors. Seriously, there’s so much green! There’s a theme in Fast Forward: FLEE, but you really don’t think about it after a couple of turns have gone by. It has characters from (and the author of) Alice in Wonderland, but I don’t think anyone is going to feel like they’re playing in that world. Losing in this game is a bit more frustrating than in most other co-ops, especially if you lose during the first chapter. You have to gather up all of the cards, put them back in order, and then you pretty much play the exact same game again. This isn’t as much of a problem after you get past that first chapter, though. I wouldn’t say there’s zero replay value here, but you will have to wait a while before playing it again for it to be a challenge. Fast Forward: FLEE is a co-op game made for puzzle-lovers. The theme isn’t very strong and there isn’t much replay value, but that didn’t keep my group from enjoying this one. We had a great time trying to work out how to move from character to character and figuring out how to avoid that monster. Similar to the Unlock games, FLEE is one of those games I’ll be happy to pass on to the next person or group and I’m pretty confident they’ll like it as much as my group did. If you enjoy tough puzzles and/or you are always on the lookout for different types of cooperative games, definitely check out Fast Forward: FLEE. If you prefer games with a lot of theme or you need a good amount of replayability, you might want to pass on this one. Thanks for taking the time to read our Fast Forward: FLEE review! To stay updated on all things cooperative board games, follow us on Twitter, Facebook, or via RSS.